This one-pan taco skillet dinner is so easy to make for a weeknight meal! It’s packed with veggies, healthy fats and protein, and amazing flavor. It’s dairy free, paleo, whole30 complaint, and AIP. Tacos are my husbands love language. Really, who doesn’t love tacos? The flavor combinations are endless and delicious, they’re fairly easy to make, and they’re usually pretty cost effective. What’s not to love? Well, if you have any food intolerances or are following a paleo or whole30 diet, the gluten, the corn, and the cheese are less than loveable. 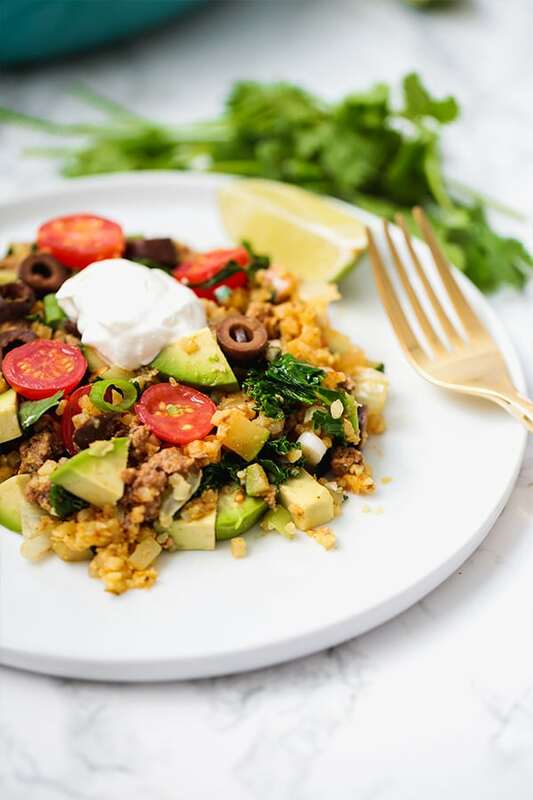 So why not do without them and opt for an easy one-pan taco skillet that’s paleo, whole30, keto, and AIP? Yes, please! 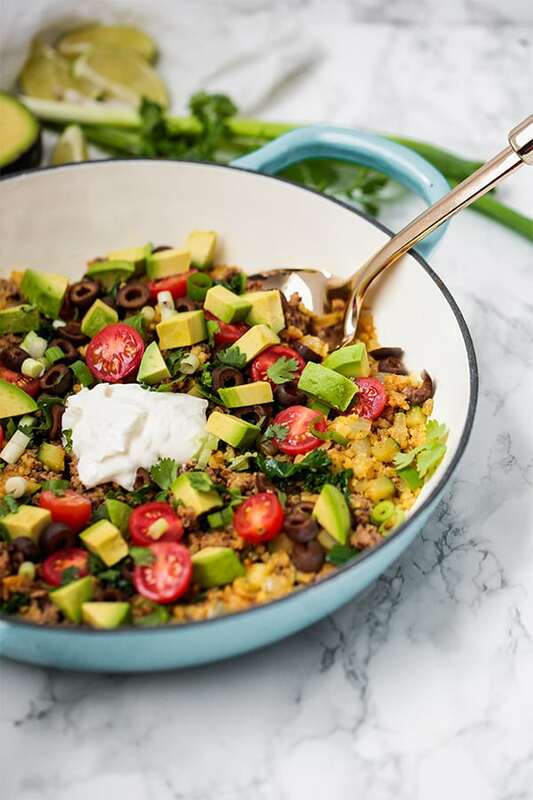 Not only does this taco skillet have all of the flavors you love about tacos without any of the allergens, but it’s also easy! Making tacos on a low carb diet like paleo or keto usually involves the extra step of making tortillas, and honestly, I just don’t always want to spend the time on it. Life is filled with too many late nights at work, unplanned traffic jams, after-school soccer games, and more to always have to make everything from scratch. 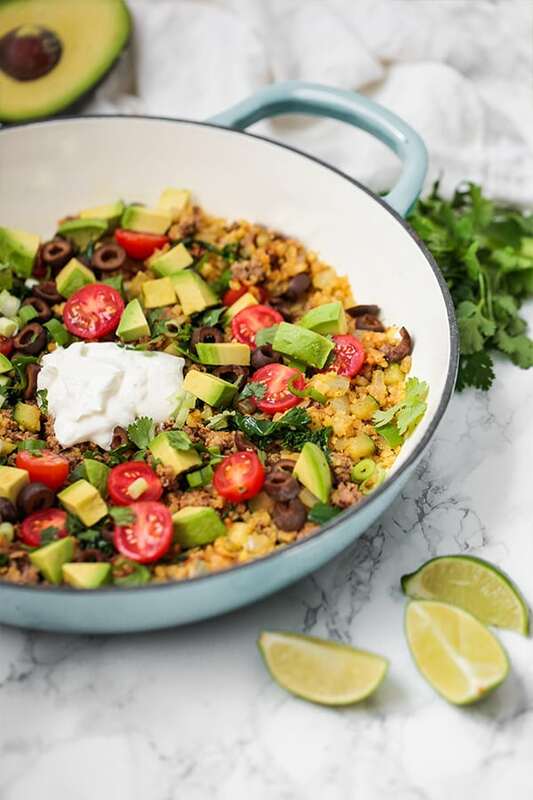 This taco skillet is a one and done one-pan meal that’s perfect for crazy weeknights, and weekend meal prep. Not only is it crazy easy to make, but it’s also crazy nutrient dense and veggie packed. This bad boy has six different veggies in it! Yup… six! And they’re all low carb, and keto friendly for stable blood sugar. It’s also full of healthy fat from the avocado and ground beef, and of course protein. All of these together make this meal healthy, and filling! But, what if you have guests or family members that have a bit broader of a diet? This taco skillet is easy to layer on with extras like cheese, chips, black beans, and more for those who tolerate it and would like it. My husband ate his portion with some Siete tortilla chips and some melted cheese, and he was a happy camper. This meal is buildable, so feel free to get creative! 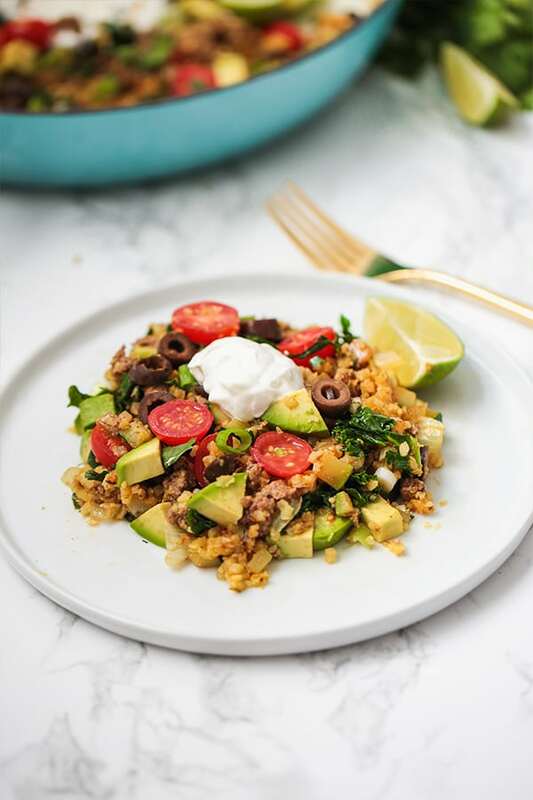 A high-quality grass-fed ground beef has the most taco flavor for this skillet, but you can technically also use ground turkey. You can buy pre-riced cauliflower from stores like Trader Joe’s, Whole Foods, Sprouts, and even Target. Or you can use a food processor to make your own cauliflower rice. You can also use spinach if you don’t like kale. The more veggies the merrier, right? All of the toppings that pull the dish together! This one pan taco skillet is the perfect easy dinner to make on the fly. It’s paleo, keto, whole30, AIP, and made to be dairy free! Using a large skillet, brown the ground beef over medium heat. Set aside and reserve the fat in the pan. Saute the onion in skillet for 4-5 minutes or until translucent. Add in the cauliflower rice and zucchini and saute until the cauliflower rice is lightly browned and the zucchini is softened. Stir in the greens and the seasonings and saute until the greens are wilted. Add the beef back in and cook for 2-3 minutes to combine the flavors. Remove the heat and add the toppings. Season further to taste and serve! Another great recipe! Made for my family and it was a hit! I love how each person can customize their toppings!